The SPRAWL Fusion 2 Stretch Fight Shorts are available at MMA Overload for only $44.99 instead of the suggested retail price of $61.99, saving you $17.00 on these newly released bad boys. That’s over 27% for a discount! The SPRAWL Fusion 2 Stretch Fight Shorts features a 4-way stretch fabric, much like the JACO Resurgence Fight Shorts but in heavier construction. I actually prefer shorts with stretch fabrics so it does not hinder my movement at all during striking and especially grappling classes. The SPRAWL Fusion 2 Stretch Fight Shorts still rocks the Channel Lock waistband system seen in the original SPRAWL Fusion Shorts and that’s also implemented on all Hayabusa Fightwear MMA Shorts so your shorts will stay in tact during training and fights, along with a wider waistband for optimal security and comfort. The side slits on the SPRAWL Fusion 2 Stretch Fight Shorts have also been repositioned in accordance to SPRAWL’s legendary research and development to help the shorts not ride up when working from the bottom position.With SPRAWL being the pioneer in Fight Short development, you can’t really go wrong, especially at this price. I’d pay full price for a pair of these any day but I wouldn’t mind saving a bit of cash. The discount applies to Black/Charcoal and Gray/Charcoal/Red colorways of the SPRAWL Fusion 2 Stretch Fight Shorts. 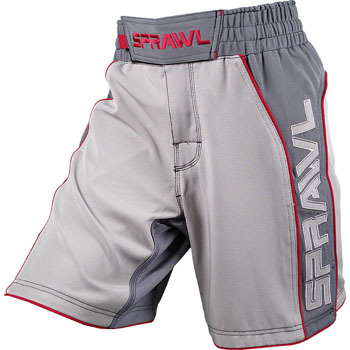 The SPRAWL Fusion 2 Fight Shorts are again, on sale for $44.99 (SRP: $61.99) at MMA Overload.